First and foremost, congratulations to everyone who participated in tryouts! I was blown away by the energy and passion in the mirror room on Saturday, it was so much fun to watch and see how much you have all improved since September. The results are out, so check your inbox if you tried out for emails from David about your new team placement. Here’s how you can help:Step 1: Share our Welcome Week events on Facebook and invite all your friends here. 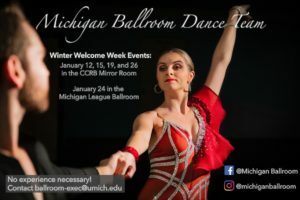 Step 2: Attend our welcome week events on Tuesday, Thursday and Saturday (details below) to cheer on your friends performing their showcases and dance with the newcomers and tell them why ballroom is the best club on campus! No DTS, come to the League instead! 8-10pm: Free Welcome Week lesson/showcases in the League Ballroom!!! 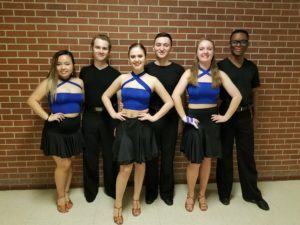 7-9pm: Come and cheer on your team-mates who are guest performing in the Cadence Dance Co. show in the Lydia Mendelssohn Theatre! Student tickets are $7 or you can get in FREE with a Passport to the Arts. More details here. Good luck with your first week of S&S lessons!